1. Decades of federal energy research laid the groundwork for many of the technologies we enjoy today. Lithium-Ion Batteries (LIBs) – DOE grants aided the discovery of low-cost battery materials, enabling LIBs to commercialize, which now power everything from laptops to smart phones. LED Lighting – DOE research produced more efficient and longer-lasting LED bulbs, which businesses have rapidly installed to take advantage of energy savings over existing light sources. Fuel-Efficient Vehicles – DOE research yielded efficient tires, light-weighting technologies, and advanced engines, reducing the fuel needs of cars and trucks and saving consumers money. 2. Federal energy research investments generate billions in economic returns for taxpayers. DOE was instrumental to developing hydraulic fracturing technology, which contributed $430 billion to U.S. GDP and supported 2.7 million jobs in 2014 alone. Forty years of DOE building efficiency research saved consumers $22 billion in energy costs. 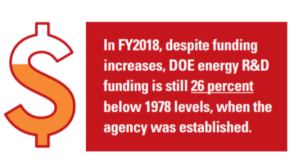 In FY2018, despite funding increases, DOE energy R&D funding is still 26 percent below 1978 levels, when the agency was established. 3. The private sector underinvests in breakthrough energy research because energy projects are expensive, time-intensive, and face high regulatory uncertainty relative to other industries. The energy industry invests just 0.3 percent of revenue in R&D, far less than the aerospace (7.6 percent), electronics (10.6 percent), and pharmaceutical industries (20 percent). 4. Government fills a critical research investment gap in the energy sector, but federal energy R&D funding has declined in recent years. In FY2017, energy was just 4.5 percent of federal nondefense R&D outlays, down from 14 to 20 percent in the 1970s and 1980s, and 8 to 10 percent in the 1990s. 5. The United States lags behind in energy innovation investment as global competition for advanced energy technologies accelerates. The United States now ranks 12th in energy R&D investments as a percent of GDP. China is the highest spender on energy R&D as a share of GDP and has become the largest destination for energy investment worldwide. To stay competitive in the billion-dollar energy technology markets of tomorrow, the United States must strategically increase federal energy research investments. Why? Global energy demand is projected to grow a whopping 30 percent by 2040. Advanced energy technologies will be needed to fill this demand, and without adequate investment, the United States risks ceding billion-dollar opportunities in these markets. This entry was posted in Blog and tagged DEPARTMENT OF ENERGY, FY2018. Bookmark the permalink.